How would this be "targeting political foes"? 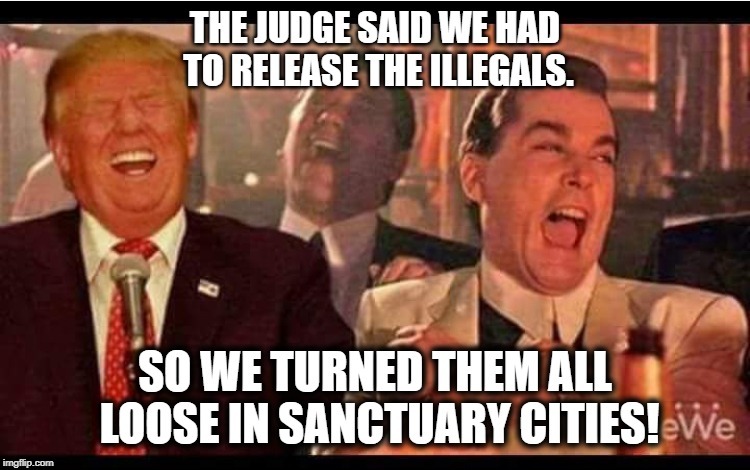 Aren't sanctuary cities a blessing for everyone? This president fights. He breaks the presidential mold. Is it illegal or wrong if under current law detainees are released to the interior, that they be released to specific cities and counties? Hmm. The national news shows were all horrified this morning about this news. First off....it was just an idea that NEVER HAPPENED. Second....it's actually not a bad idea...LOLOLOL. No one trolls the political enemy quite like the President. .... The Radical Left always seems to have an Open Borders, Open Arms policy – so this should make them very happy! My my how the media is hyperventilating over this. Whats the problem - these people are an ASSET and deserve a safe space. So say the rats. I'm shocked they aren't happy to accommodate them. Wouldn't this be tantamount to acknowledging the legitimacy of the right of the sanctuary City declaration in the first place? Also, what keeps all these criminals he dumps in those cities, in those cities? Good thing he rarely is serious about these threats. Seattle Mayor Jenny Durkan (D) wrote that her city is not “afraid” of immigrants in response to President Trump's his proposal to send detained undocumented immigrants to “sanctuary cities." Trump announced Friday that he is mulling sending the migrants to sanctuary cities, or cities that do not cooperate with federal immigration authorities through information-sharing or detaining immigrants, as a way to retaliate against Democrats. Sounds like a plan then? Mark Levin did a monologue today about sending the illegals to Blue States, along with 90 percent marginal rates, Green New Deal, etc. Can you picture GHW Bush, Dole, GW Bush, McCain, Romney, or Speaker Ryan fighting hard like this? No, I can’t. Donald Trump was the right man for our time: a man who fights back against the tide of socialism, using all the tools available to an American patriot president.